Don't forget to use your favourite cashback site. Use SVOOMAR13 to get 3 years (add 3 to your basket) subscription for £55. Just bought it and this pops up after the payment screen. All done! Thanks for your order. Your order number is ************ and confirmation has been emailed to my your email address. These details have also been emailed to you. This is usually quite quick, but please allow up to 24 hours for delivery. Now I wonder I have things covered until like August 2014 so not sure it is worth me extending that just yet. Nice find OP ... hot!! Ha so typical, I only just recently joined psn+ about 2 weeks ago via the £29.99 deal but I'm still happy with the price, I got more than my moneys worth straight away, downloaded 2 full vita games, infamous2, god of war, LBP2, motorstorm apocalpyse, dead or alive 5, mortal kombat, vanquish and a bunch of others. should have joined earlier! I take it I can buy this and add another year on? Will psn+ be around in 2 years time? Nice deal for those that didn't get the blockbuster deal. Ha so typical, I only just recently joined psn+ about 2 weeks ago via the … Ha so typical, I only just recently joined psn+ about 2 weeks ago via the £29.99 deal but I'm still happy with the price, I got more than my moneys worth straight away, downloaded 2 full vita games, infamous2, god of war, LBP2, motorstorm apocalpyse, dead or alive 5, mortal kombat, vanquish and a bunch of others. should have joined earlier! I take it I can buy this and add another year on? Will psn+ be around in 2 years time? If you've got a US and UK PSN account could you add this to the US account and is there any benefit in doing that? 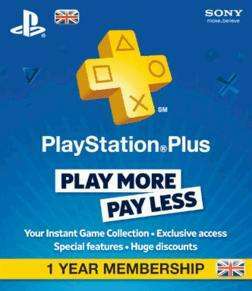 Never been interested in playstation plus, as you lose your games after a year, but is it worth it for £19.99? No doubt I'll get slaughtered for this post, but I always think I could get a few second hand games for £20/£30 and resell them when finished, as opposed to "virtually" owning games on the PSN, then having the keep pumping money at it in order to keep them? Already been announced that PS+ will be on PS4. The PS+ service will continue on PS3 anyway, regardless. It's unclear whether your PS+ account and months on PS3 will transfer to your new PS4, but it'd make sense if they implement that as well. If you've got a US and UK PSN account could you add this to the US … If you've got a US and UK PSN account could you add this to the US account and is there any benefit in doing that? I believe the code is UK only. For what you get, it's worth £19.99 even if you look at it as a rental service which just keeps sending new games without having to return the old ones until your sub ends. After the year if you decide it's not worth it, then you've had a years worth of games to play for £1.65 a month, which is hard to argue with. Awesome deal. Heat added and purchased. Cheers op. anyone in doubt and never tried ps plus you need to get this. It works out about 1.70 a month and you get at least 3 new games a month and cloud storage for save games. It is an absolute bargain. How long would these be valid? I'm considering buying for more than 1 year as I doubt they will ever be this cheap but I'm certainly not going to buy a PS4 at launch so there will be a gap between when this 1 year subscription ends and where the next one will begin. Or do you think they will keep adding PS3 games once the PS4 is out? What happens if you buy games on there which are cheaper for PS+ members, then the subscription expires? Does this expire!?!? I want to use it but I'm only going to buy a PS3 in June. I guess £1.70 a month seems cheap to effectively rent a few games here … I guess £1.70 a month seems cheap to effectively rent a few games here and there...What happens if you buy games on there which are cheaper for PS+ members, then the subscription expires? My personal view is that it is well worth it. £30 per year or so is not much to enable you to have access to so many games without any significant effort. You need a decent unlimited internet connection and a big hard disk is handy too, but if you have those anyway then it is spot on. Say you are buying and selling 2nd hand games. If they cost £10 on average and lost 10% of their value in the time it took to finish them, £1 a game as and when sounds a good option. The reality though is that you will keep some of them and you will have to pay to sell them (i.e. ebay fees and postage) or take a bigger hit on cost trading them. You will also have to take time effort and potentially cash to obtain them. £30 may be more likely to cover the cost of two kept and three traded. In that same time you would have had around 24 games from PS+ and provided you keep subscribing they will continue to be there. op this is a insane price thanks! bargain thanks got mine for 14.99 using my points. Yes it is - it seems that Uncharted, along with Gravity Rush, will always be free on PS+ for PSVita, likewise LBP2, Mortal Kombat and Motorstorm are always free on PS+ for PS3. Now I wonder I have things covered until like August 2014 so not sure it … Now I wonder I have things covered until like August 2014 so not sure it is worth me extending that just yet. Well I've just used this to sub up until August 2015!! Current PS3 games you get with PS+ are: Mass Effect 3, Dead or Alive 5, Joe Danger 2, F1 Race Stars, Quantum Conundrum, Guardains of Middle Earth, Mortal Kombat, Littlebigplanet 2, Motorstorm Apocalypse and Infamous 2. For the Vita there's Uncharted: Golden Abyss, Gravity Rush and Lumines Electronic Symphony. This should get insanely hot. Best price it has ever been and its stackable so you could get a few years worth in one hit here ready for ps4 and protecting against any price hikes. Does this expire!?!? I want to use it but I'm only going to buy a PS3 in … Does this expire!?!? I want to use it but I'm only going to buy a PS3 in June. Haha, ok seriously this is a really great price, I don't have a PS3 either but will pick one up when it's cheap or if we see a PS Vita slim. I wish Sony extended this free games service to PSP though, I still really like mine! the games shouldn't be worth much now too.